About ten years ago I walked into an office supply store in search of a new printer. Both of the inkjet printers I owned had stopped working, and I needed a replacement. As I walked through the aisles of all-in-one printers, single function inkjet printers, and laser jet printers, I was still unsure which model to select. I didn't want to invest a great deal of money, but wanted a printer that would last a few years. Not feeling satisfied with the models available at the store, I walked towards the exit. That's when I saw the printer sales table. There was a brand new small, white printer, but for some reason on sale. It was listed for $50.00. 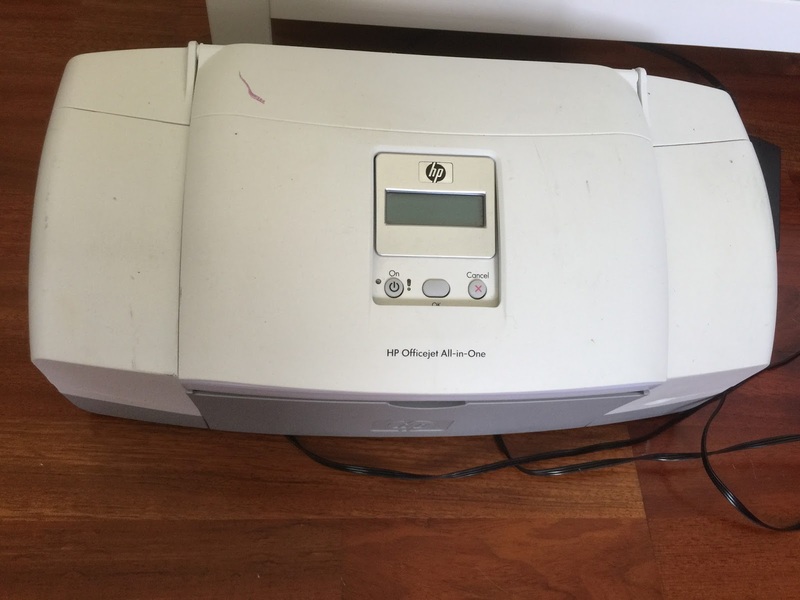 The printer, a Hewlett Packard Office Jet 4300 turned to be an all-in-one printer with printing, faxing, copying, and scanning capabilities. 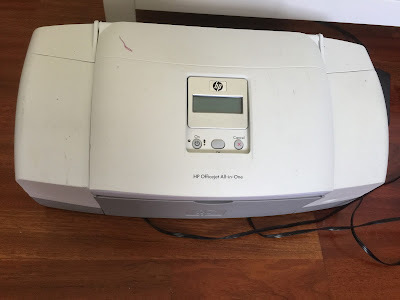 After Hewlett Packard stopped supporting the printer, I was no longer able to use it as a scanner. Faxing is not possible for me as I don't have a landline phone. Additionally, more recently, most printers have wireless capabilities, which allow printing from mobile devices as well as computers. For that reason, I decided, I would purchase a new printer when the ink cartridges ran out of ink. I began a relaxed search for a new printer. Unfortunately, while in the middle of relocating my home office from the bonus room to vacant bedroom, I inadvertently knocked by printer off a tall dresser. After plummeting about four feet, the printer crashed to the floor, remaining in the location when photographed (see above picture). I reconnected the printer. It cycled as though it would still work. However, although I heard the print heads moving as part of the initial power-up process, the printer displayed a jam message. Several times I tried to start the printer, each time with the same result. After many years of excellent printing, I placed the printer in a bag for recycling. Office Jet 4300 served me well, and I definitely got my money's worth, at the tune of $0.42 per month, excluding printer cartridges, but that's another post.